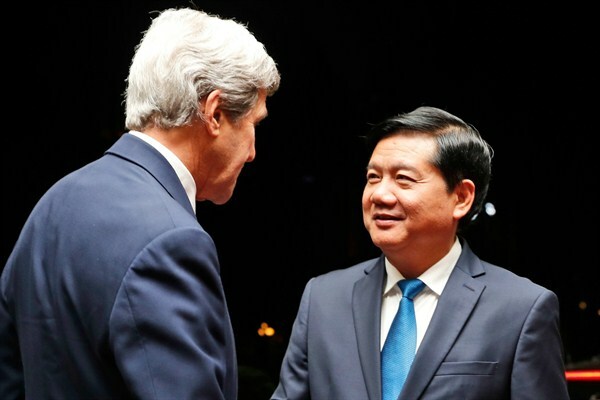 Dinh La Thang, who was recently dismissed from Vietnam’s Politburo, greets former U.S. Secretary of State John Kerry in Ho Chi Minh City, Vietnam, Jan. 13, 2017 (AP photo by Alex Brandon). Vietnam’s campaign against corruption notched a significant victory earlier this month with the removal of a top Politburo official for “very serious mistakes and violations” while he was chair of PetroVietnam, the state-owned oil and gas company. But analysts say that there is a more complicated story behind the rare Politburo sacking—just the fourth in Vietnam’s history and the first for corruption—that involves personal and factional maneuverings at the top levels of the ruling Communist Party.